Tonight sees the launch of the second season of WWE's Mixed Match Challenge series and Sky Bet's markets - where customers can place wagers on the team they believe will be the outright winners - is still available. As of the time of writing, the market is still showing the same pricing as nearly a fortnight ago. For those checking in for the first time, a table below with the current odds - and how they differ - from the initial price. 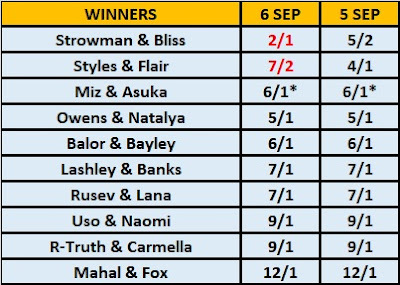 By the way, for those wondering, I have an asterisk next to The Miz and Asuka's 6/1 because - at the moment - Sky Bet is offering a price boost from 4/1 on the previous winners doing the repeat. When the participants were first announced, I was keen to see if - like season one - the teams will be competing for certain charities. I have been unable to find out this information, so I presume this isn't the case for season two. With that said, WWE is publicising its Connor's Cure charity this month and will then likely have a Susan G Komen campaign in October, so I can sort of understand why there isn't a charity theme for this edition of the programme. Without being able to try and guess which team will win by looking at who each twosome is representing, which was one of the reasons - other than Asuka's win streak - why I backed The Miz and Asuka to win season one (my trick was to see any charities I hadn't associated with WWE in the past like Rescue Dogs Rock), I decided to hold off until today to place a wager on the outright market. I have a strong opinion that at least one of the two teams at the top of the list won't be in the final. The reason why is because the winners will be determined at the Tables, Ladders and Chairs PPV on December 16th. Main eventers like Braun Strowman and AJ Styles are likely to be in other matches on the night (note: Strowman's name was listed in the placeholder info sent to the SAP Center as being in a trios match with Dolph Ziggler and Drew McIntyre against The Shield, but I highly doubt this will happen in December considering we're getting this match in two weeks). So, if I were to ignore the top two, and then fade last year's winners, I am left with the next seven. I don't think Jinder Mahal and Alicia Fox have a chance, so they're scrubbed as well. I could make a case for the rest: Jimmy Uso and Naomi (final is in California), Rusev and Lana (bound to be popular with the audience in the interaction part of the tournament), Owens and Natalya (I think they'll be a unique pairing). 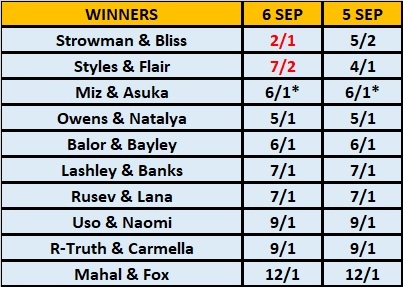 I've carefully considered backing Finn Balor and Bayley (6/1) as well as Bobby Lashley and Sasha Banks (7/1). The thing that has forced me to bet light on these two teams is if the rumours of a women's tag team championship becomes a reality. I'd have Bayley and Banks as the inaugural titleholders, so that could mean they're in a tag title match at TLC. One team that is screaming out to me to back is R-Truth and Carmella. I have enjoyed their interactions on TV lately and I like the 9/1. You're also safe in the knowledge that the pair will easily be out of important programs come mid-December.